Today I ran up Cerro Pochoco with the RunningChile team. It was great to run this peak that I'd hiked with V and Fede a few weeks ago. I thought that it was much longer after the hike, but actually it's a short distance with a lot of altitude gain that makes it a fun and tough run. The views of Santiago are spectacular as they are from a different place and greater altitude to my usual view from Cerro Carbon. 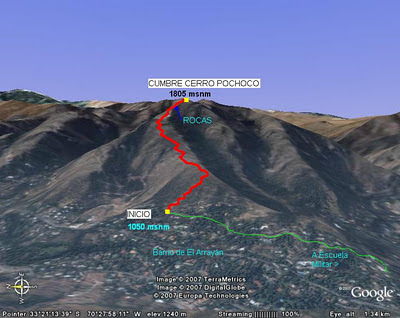 Still a lot of work to do from Pochoco-chico. It was a great run and fun peak to work up at a hard pace.